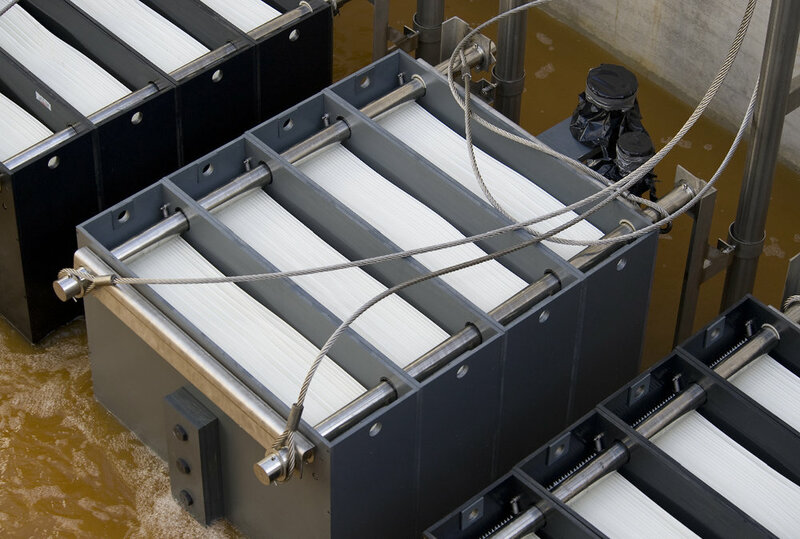 Tighter discharge regulations, urbanization and increased water recycling efforts have made membrane bioreactors (MBR) the leading innovation in wastewater treatment through conventional activated sludge. With MBR technology, the clarifier is replaced by a physical barrier – the MICRODYN BIO-CEL® membrane module. This physical barrier enables the MBR to operate at higher MLSS levels than secondary clarifers, resulting in a smaller overall footprint. BIO-CEL membrane modules operate within the ultrafiltration spectrum, producing high capacities of quality effluent at consistent flows. BIO-CEL utilizes a unique membrane laminate that offers the best of the two predominant module configurations on the market (hollow fiber and plate & frame) without any of their inherent disadvantages. The self-supporting membrane sheet is just 2 mm thick, resulting in an extremely high packing density and very low specific energy consumption. The membrane laminate also has a self-healing mechanism. In case of damage to the membrane, the spacer material in between the BIO-CEL membrane laminate sheets allows for a sealing of the damage through use of the biomass in the system. Even after a severe detraction of the membrane laminate, solids and bacteria are still rejected by the BIO-CEL module. The modules´ open channel design reliably prevent the deposition of sludge and fiber accumulation during the continuous crossflow operating process. The self-supporting structure of the membrane module enables frame-free installation, eliminating blockages around the external boundaries of each component. The membrane module is configured to allow for consistent permeate flow and a highly effective backflush over the entire membrane surface. In summary, MICRODYN BIO-CEL® MBR offers high packing density with optimal separation. MICRODYN® BIO-CEL MBR follows a simple process involving filtration and backflush steps to achieve a high quality permeate. The membrane module is configured to allow for consistent permeate flow and effective backflush over the entire membrane surface. The use of fine bubble aeration with BIO-CEL® leads to energy savings, optimized oxygen transfer, and the highest efficiency due to cross flow operation and equal air distribution during biological wastewater treatment. The above clip shows a glimpse inside the aeration of the BIO-CEL® MBR module. The unique laminate technology allows for self-healing of the membrane sheets through use of the biomass in the system. Even in cases of severe damage caused to the membrane, the compromised part heals itself; the originally high effluent quality can be restored in less than 2 minutes. This clip depicts the self-healing principle on a lab scale. The BIO-CEL® membrane module can be cleaned mechanically through the use of the patented BIO-CEL® MCP (Mechanical Cleaning Process), to help reduce operating costs. Long term experience shows that an almost chemical-free operation is possible through reduction of fouling layer formation. The membrane cleaning process is supported by crossflow aeration and the cleaning efficiency of inert, organic material (MCP granulate). This movie depicts our BIO-CEL® production line in action. 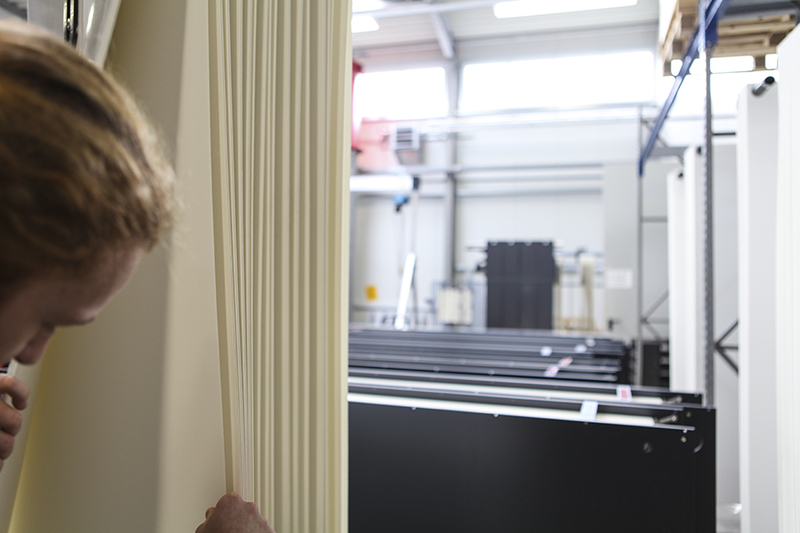 From the membrane laminate to the module assembly, We have fully automated BIO-CEL production capabilities in both Wiesbaden, Germany and our new manufacturing facility in Austin, Texas, USA.